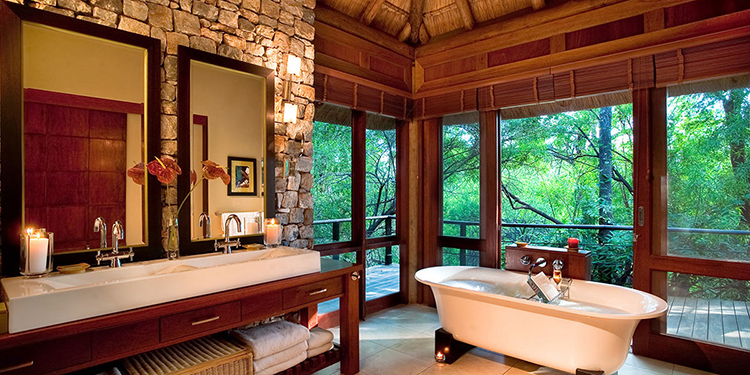 Luxury bathroom design and nature are a very good match, as it is clearly shown in the above example. The wide French doors ensure a good view on the beautiful garden on the background, while the strategical placement of the bathtub in the middle of the room allows you unique moments of relax while enjoying all the nature around you. 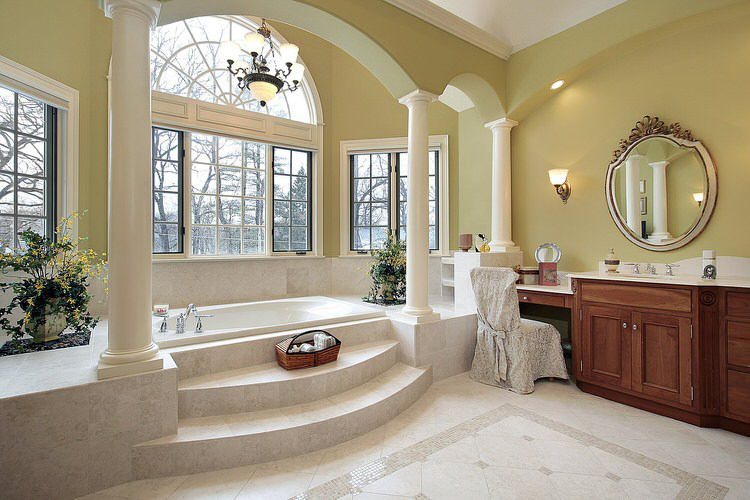 In this cool example of luxury bathroom design the small staircase leading to the built-in bathtub works as both a nice ornamental motif and an area where to sit down and have a nice conversation with your partner. The comfortable shower box with glass panels and the white tiles add a sense of brightness and cleanness to the whole composition. 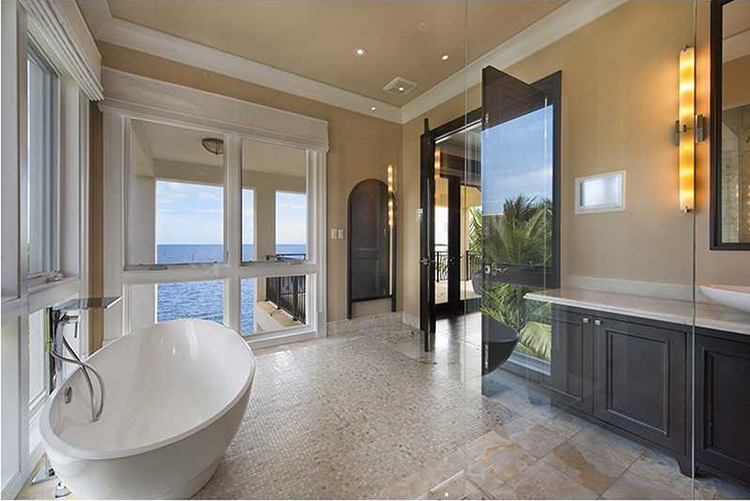 The amazing view on the beach enjoyable through the wide glass pane door characterizes this nice example of luxury bathroom design. The palette of sand shades repeats the same colors of the beach in order to create a continuum between indoors and outdoors. Notice the nice couch where to stay in meditation in front of the sea and the practical shower box with glass panes. 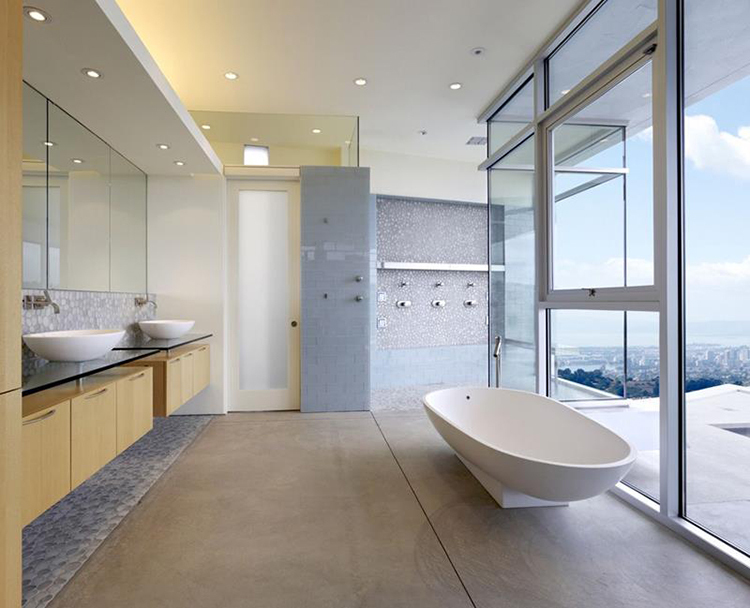 The utilization of avant-garde furniture and huge glass pane doors makes this example of luxury bathroom design look fully merged with the outside world. Notice the large and unusual shaped bathtub in the foreground and the practical dressing table with long washbasin and huge wall mirror that makes the room look roomier and bigger. 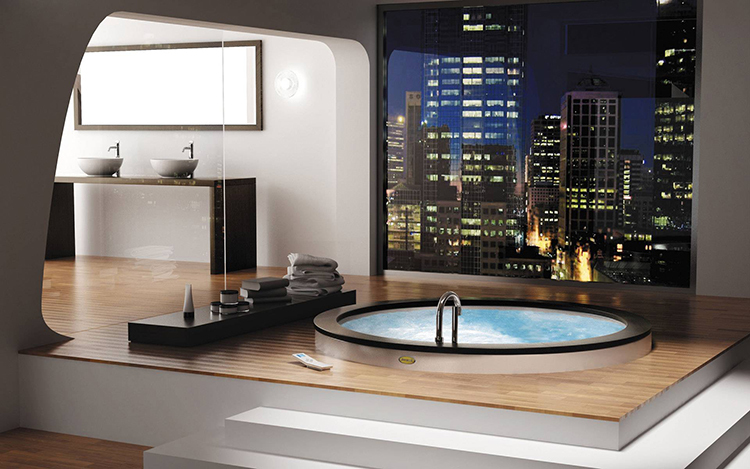 In this cool example of luxury bathroom design, you can enjoy an amazing view on the mountains while you are relaxing in the comfortable Jacuzzi smartly placed near the large corner window of the room. The palette of light walnut, white and dark brown combines with the linear and clean shapes of the furniture in order to create a bright ambience of extreme elegance and sophistication. Small but bright and comfortable, this example of luxury bathroom design clearly shows how powerful large windows can be in creating cool ambiences in architecture . 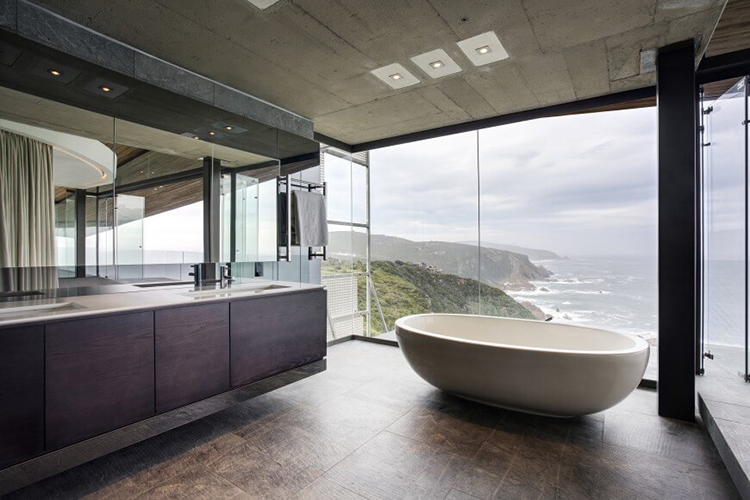 The stunning view on the cliff does not need any further comment and perfectly pairs with the minimalist furniture of the room that is reduced just to one small bathtub, one towel rack, one vanity mirror and one tiny washbasin. The monochromatic palette of white and light grey combines well with the large French window in order to create a very bright and roomy ambience in this example of modern luxury bathroom design. 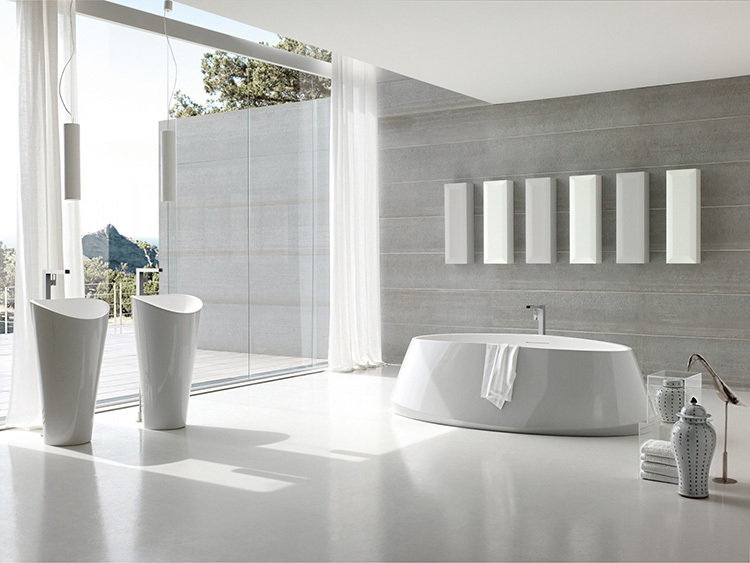 A further touch of roominess and cleanness is added by the linear shapes of the bathtub and the two freestanding washbasins. The long French window provides an amazing view on the wood in this cool example of luxury bathroom design. 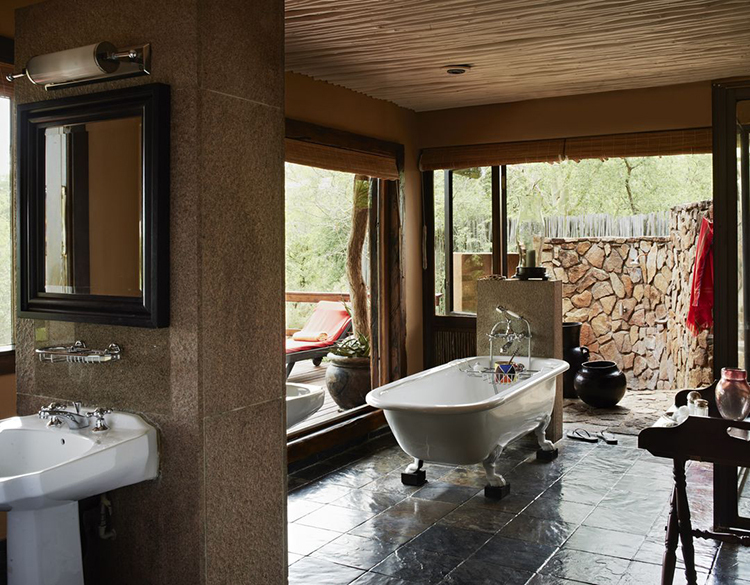 The traditional wooden furniture and the wall in stones perfectly harmonize with the outdoors, while the bathtub has been placed near the window in order to allow you to enjoy its nice view. 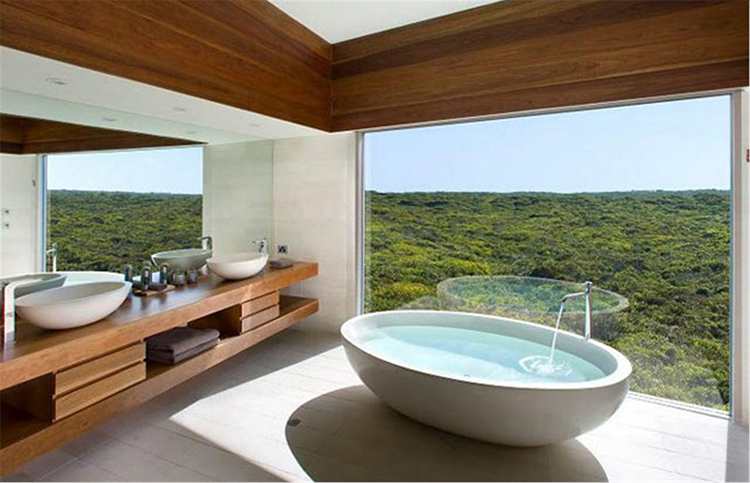 Minimalism is probably the design style that better exploits French windows and their nice views on natural settings, as this example of luxury bathroom design clearly shows. The palette of colors of the room harmonizes very well with the pale colour of the birches in the background , and a feeling of uninterrupted continuum between outdoors and indoors is thus created. 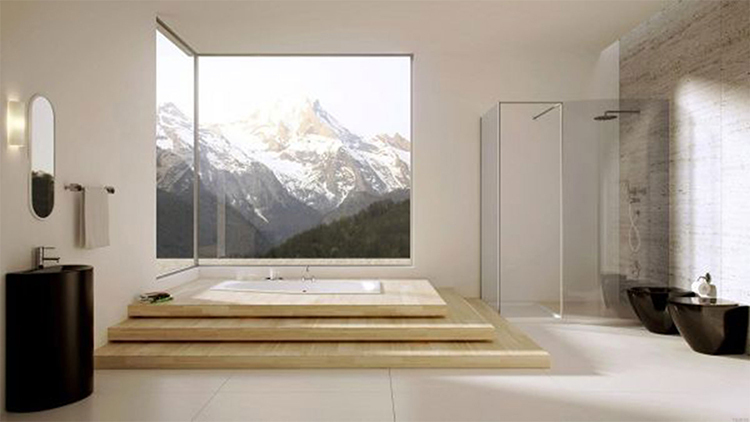 The beauty of the mountainous landscape that we can enjoy through the large window perfectly merges with the simplicity of the interior in this cool example of luxury bathroom design. Notice the wide and comfortable box shower with transparent glass panels and the large, practical dressing table with drop-in washbasins and huge wall mirror. A typical example of luxury bathroom design with classical columns and ornaments , posh fittings, Jacuzzi built in a split-level , big and comfortable dressing table with wooden cabinets and elegant oval vanity mirror, and, last but not least, large French windows that gives you an astonishing view on the park of the mansion. 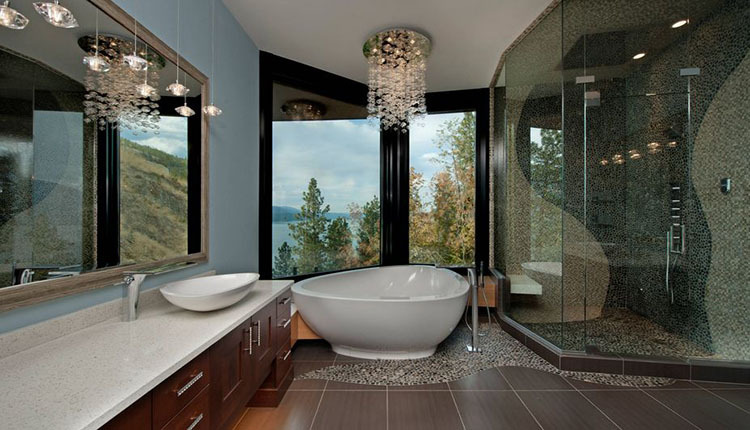 Another example of smart utilization of corner windows and their stunning views is shown in this luxury bathroom design. 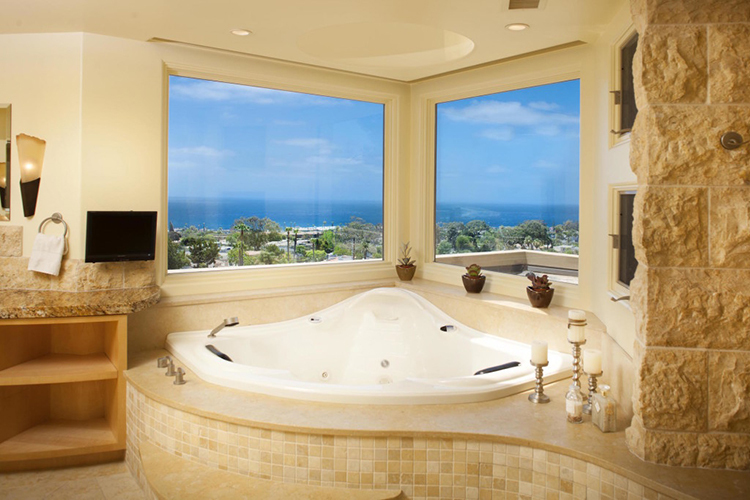 The Jacuzzi has been conveniently placed in the corner where the two windows have been opened in order to allow you to enjoy the beautiful view on the sea. In this example of luxury bathroom design, the room has been split in a wash area furnished with elegant wooden counter with washbasin, gorgeous wall mirror and comfortable shower box, and the area near the big French window dedicated to the bathtub. 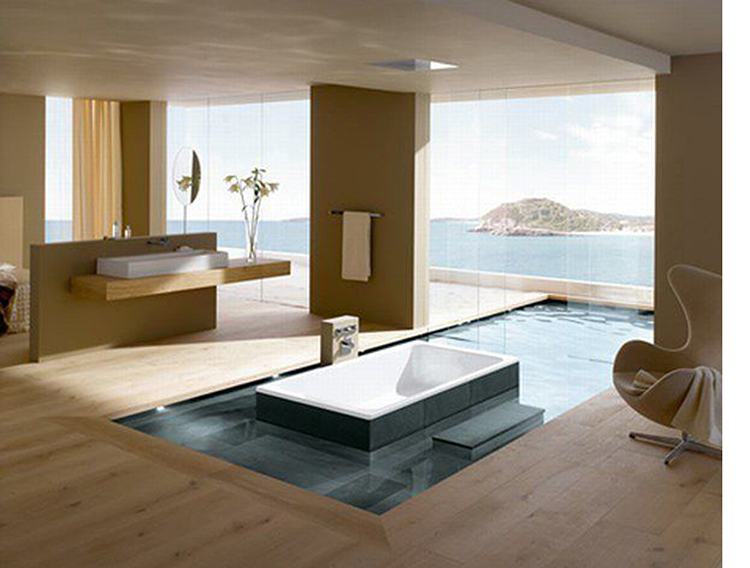 In this way the bathtub and the nice view behind become the focal point of the whole composition. 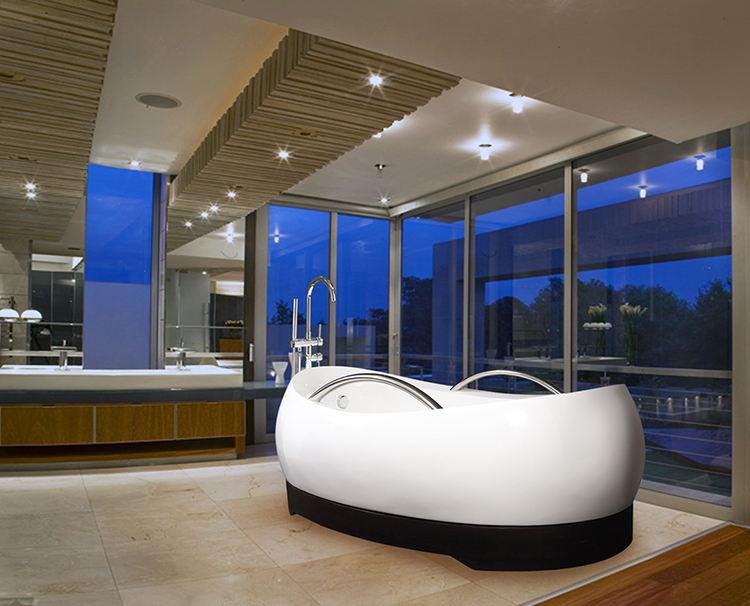 The idea behind this roomy luxury bathroom design is utilizing space as an architectonical element. The wide windows and the empty room with minimal furniture create a bright, spacious ambience that merges with the outdoor environment thanks to the stunning views that the large French windows allow. 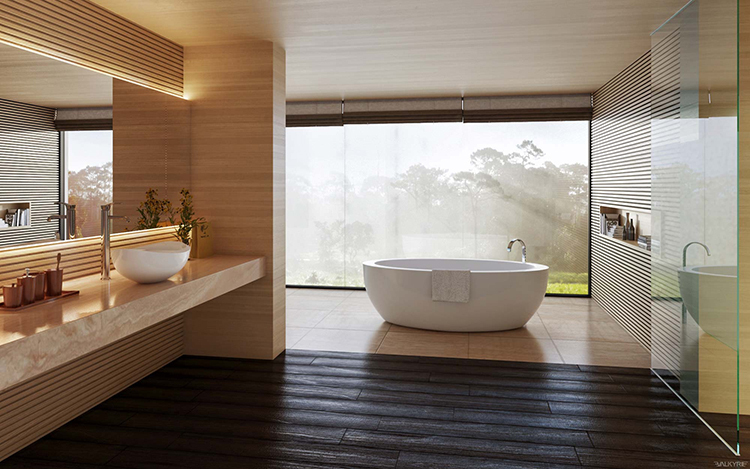 The scenic view on the forest pairs very well with the linear shapes of the wooden furniture in this cool example of luxury bathroom design. 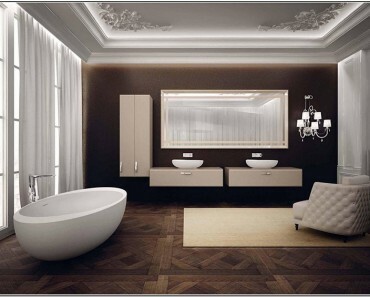 Practicality is ensured by the large and modern dressing table complete of two washbasins and big vanity mirror and the simple yet elegant bathtub set just in front of the large window. The division of space in sub areas and the utilization of several split levels generate a pleasant, dynamic effect in this smart example of luxury bathroom design. 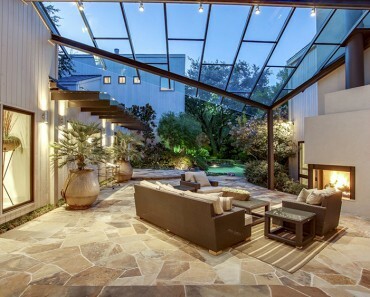 The porch that we see over the small pool in the middle creates an element of continuity to the outside that connects the room to the balcony. 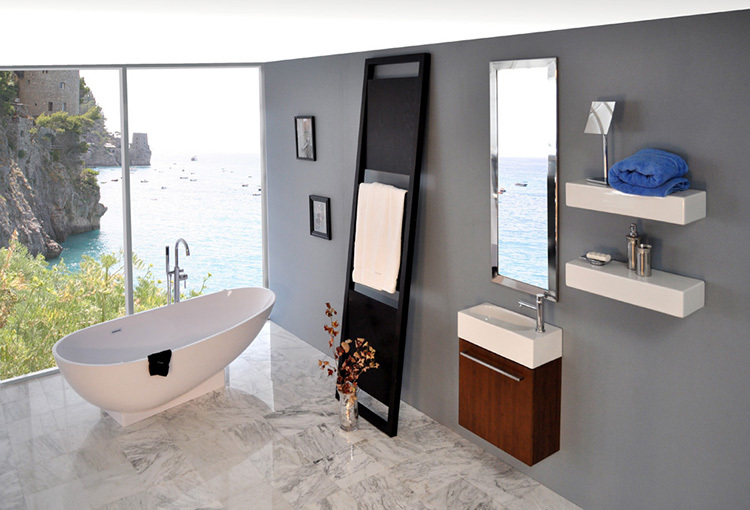 One built-in bathtub and two freestanding washbasins with vanity mirrors provide you with all the comforts you need. The simple, minimalist style of the dark walnut wooden furniture combines perfectly with the white colour of the room and the wonderful view on the lake creating an ambience of extreme sophistication and elegance in this cool example of luxury bathroom design. 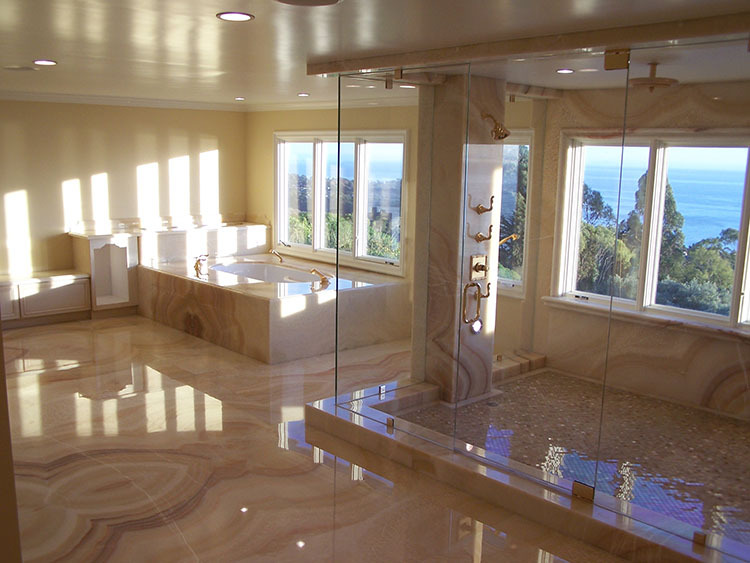 White marble is heavily utilized in this gorgeous example of luxury bathroom design in order to create a bright and posh ambience that will certainly impress your guests. Notice the huge shower box with glass panels and sophisticated golden fittings, and the spacious built-in Jacuzzi that ensures the best of comfort. The palette of silver, white and dark brown repeats exactly the colours of the outside environment in order to create a sense of connection to the beautiful mountainous landscape that we see through the large window in this cool example of luxury bathroom design. 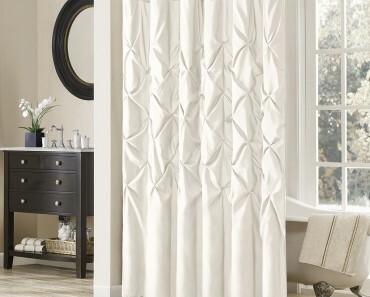 This example of luxury bathroom design is all centered on the wide windows and the large balcony that works as connecting element with the outside. The bathtub is unusually set in a small pool not far from the original dress area that is reduced to a wooden counter with large washbasin and an essential but nice freestanding round vanity mirror. The white walnut wooden floor adds a touch of warm charm to the whole composition. 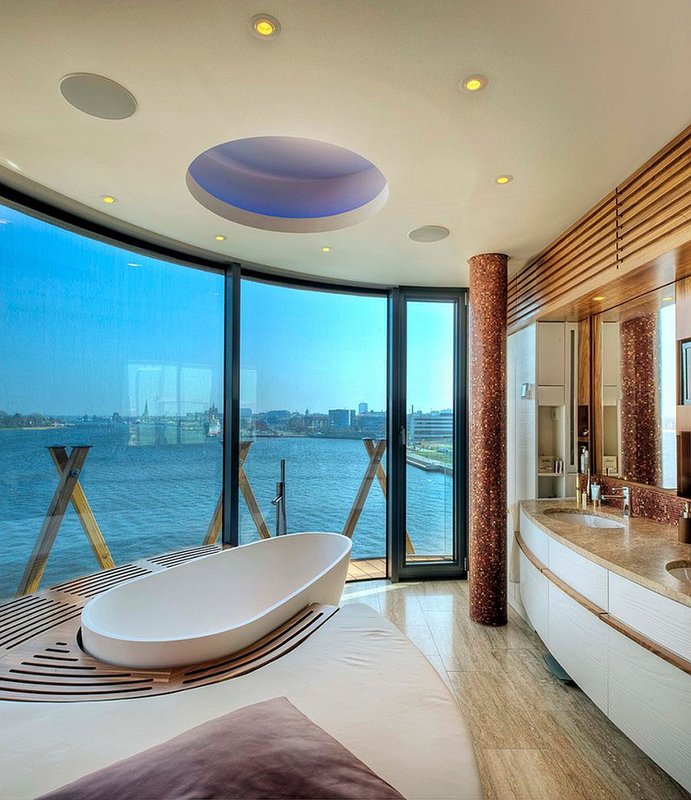 Like in a movie, a big window offers a very scenic view on the skyscrapers of the town in this luxury bathroom. The round Jacuzzi has been built in a large and very comfortable wooden base equipped with a nice small staircase of access. Notice the wall mirror that make the room look bigger and brighter, and the cool dressing table with long vanity mirror and two washbasins. The huge window creates a bright ambience where there is no actual separation from the outside in this luxurious bathroom with breath-taking view on the far town. The long dressing table with glass countertop, cool oval washbasins, wooden cabinets and long horizontal vanity mirror provides a practical dress area, while the large shower box and the bathtub in the foreground are great places to spend time and relax. Round and sinuous shapes combine with shimmering tiny tile decorations, wooden panels and marble countertops in order to generate a warm and bright ambience that rhymes with the amazing view on the sea on the left in this cool design. Notice the big and multipurpose base of the bathtub that works also as couch and bench where to sit down while getting dry. The utilization of classical style furniture, palette of white and white smoke and a layout all centred on the big and comfortable bathtub set near the huge window with a view on the port generates a sort of naval effect in this cool bathroom. 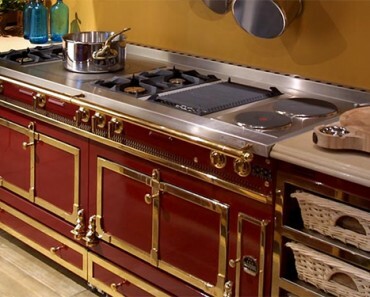 Light is everywhere, which makes this design perfect. In this design, the division of space in clear areas creates a combined environment where the architectonical elements like the transparent glass panels of the shower box work as partitioning elements. The big bathtub is built in a large base that works also as a bench, while the sturdy dressing table with marble countertop and two drop-in washbasins looks both comfortable and gorgeous. 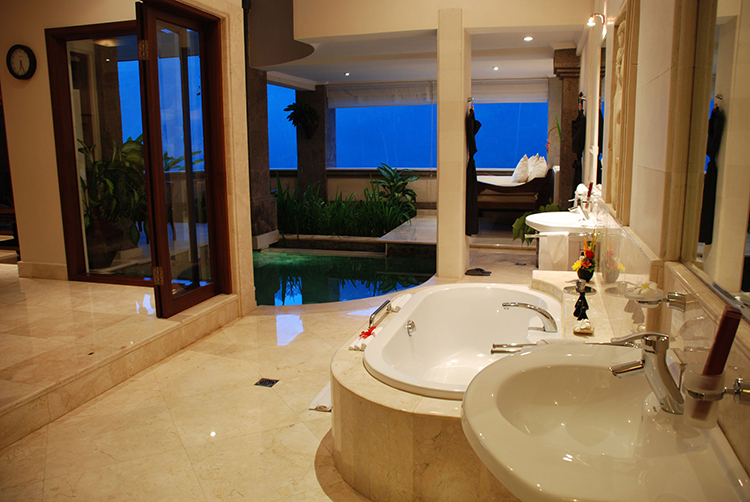 The big scenic view on the sea and the coast line is the real strong point of the design of this luxury bathroom. Furniture is essential but comfortable, as the main idea of the whole composition is to valorise the nice view we enjoy through the huge window running all around the right side of the room. The large decoration made with small pebbles of two different shades of grey repeats the motif of the natural outside environment in this tasteful bathroom. The big, stylish dressing table with wooden cabinets, oval washbasin and fine taps provides you with all the necessary comforts for your toilette.